It’s spring fever. That is what the name of it is. And when you’ve got it, you want — oh, you don’t quite know what it is you do want, but it just fairly makes your heart ache, you want it so! It is exciting when new plant introductions bump up against spring. If you love gardening, you know how easy it is to surrender to spring fever. When the urge to plant strikes, you scurry about in a feverish excitement that can make a shark feeding frenzy seem like an afternoon picnic on a Seabeck, Washington beach. Spring fever may be a response to eons of planting our food sources in the early part of the year for later harvest. The coming of the growing season has long conditioned us to sow and plant with a frenzy so that we would not starve, and harvest enough to hoard a cache of food over winter. Whatever the reason that causes planting fever, every year, on cue, the urge to dig in the soil comes on with a passion. We now have the luxury to cultivate a plant that does not have to fill our bellies with food, clothe our bodies, or provide structure for our homes, or utilize for utensils or vessels. Even though we still plant our edible crops, we also enjoy the ascetic qualities of plants so that we can sit out under the shade of a beautiful tree. If a plant is attractive and provides a harvest, that is a bonus! Every year we welcome the new plant on the block. It keeps us excited, always coming back for more. Although it will not cure the new season fever, it may tamp it down, at least until next spring. The lineup of new plants is sure to become welcome members of many gardens around the county. Let us peek at some of the new varieties coming down the horticulture pike this year. 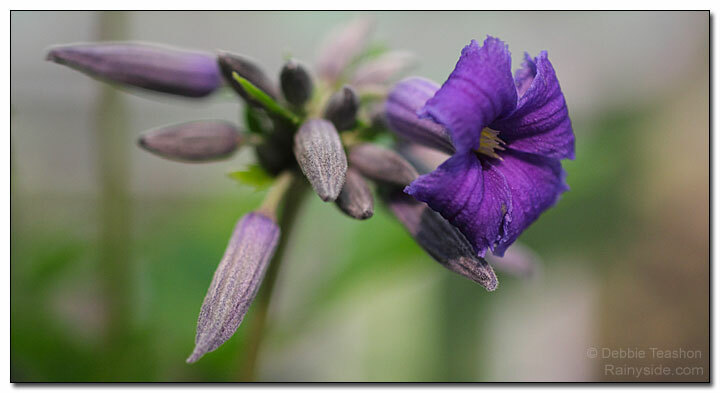 Most of us are familiar with a climbing clematis vine. Lesser known are the species and cultivars that do not climb. Most of the non-climbers sprawl on the ground or behave as opportunists leaning on their neighbors. The new cultivar Clematis 'New Love' has erect woody stems that stand upright without any support. The variety reaches 2-3 feet tall by 1-2 feet wide. Clusters of sweetly scented, deep violet-blue, star-shaped flowers, blossom on new wood. Plant your new love in the full sun to part shade border, as a specimen in a fertile, humus-rich, and well drained. You can also plant it in a summer container. In late February to early March, prune the stems down to 4-inches tall. Although technically not a new variety, this medium-sized pyramidal tree from China is rare enough to include in the group. What excites tree lovers is its exfoliating bark that rivals many birch trees. It is not surprising since birch and filberts belong to the same family — Betulaceae. First introduced to our country in 1996, this tree is a fine specimen tree for the landscape. In fall, the leaves turn a soft yellow hue. 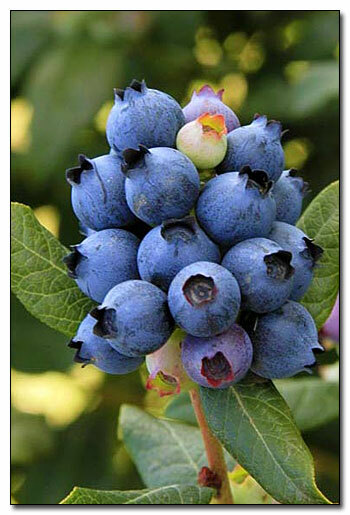 A blueberry discovered in Oregon and aptly named Vaccinium 'Perpetua', gives two berry crops per growing season. Most blueberries bloom and fruit on old wood after going through a chill period in winter. 'Perpetua' does the same; however, it also blooms on new wood without the usual cold requirement, fruiting another crop of blueberries in the fall. The dark green, glossy leaves on a compact plant make it a fantastic addition to the landscape. 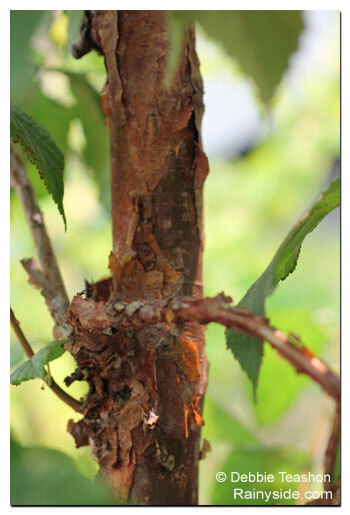 Two other attributes going for this shrub are the dark red, fall foliage, and its newer canes are a distinct yellow and red color in winter. Use this shrub as an edible, ornamental, and wildlife forage plant. 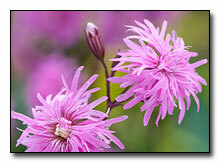 A lychnis that will not make a weedy, seedling mess in your garden — yes! You won't rue the day you planted this one since the flowers are sterile it does not seed around. This well-behaved perennial has double lavender flowers on compact plants that reach 14-inches tall. This perennial is versatile enough to grow in full sun or partial shade too! Debuting this year (2016), look for it at your favorite garden centers. 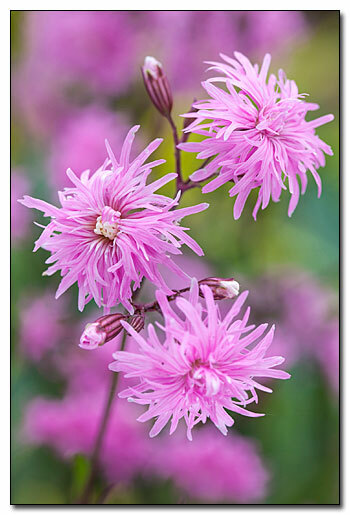 If you want a similar but taller Lychnis, there is always 'Jenny'! 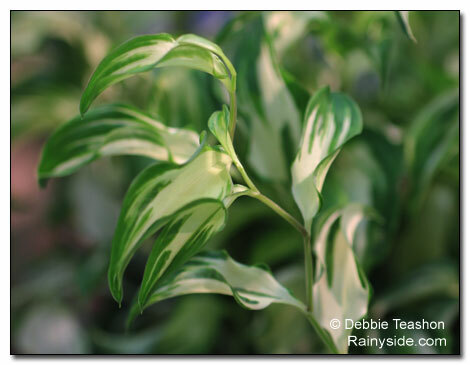 If you love variegated plants, be prepared to fall in love with this shade-loving perennial. A 2015 introduction, this naturally occurring branch mutation gave us variegated Disporum cantoniense ‘Moonlight’. This little mutant starts out cream and green. As the weather cools in autumn, the foliage takes on shades of purple and pink. Its flowers are the typical fairy bells of the species. These grapes originally bred for research, we can grow a true dwarf grapevine reaching only two-feet tall. Grow this in a container as an ornamental plant and have fruit on your outdoor table at the same time. 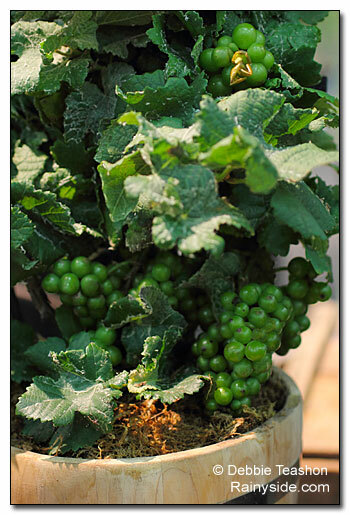 This miniature vine provides another dimension to the phrase "table grape"! Although recommended for containers, you can grow the pixie grapes (Vitis vinifera 'Pinot Meunier Purple' and ' Pinot Meunier White') in your garden. Use the fruit for home-fermented wine or champagne. The grapes are also edible with a sweet, tart flavor. The best part is you can easily hide the small plant under bird netting when the grapes get close to ripeness. Despite the tropical flair, this evergreen shrub is hardy for our region. 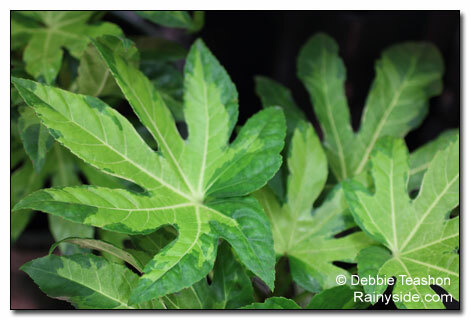 Fatsia 'Variegata' really adds a bold look to the garden. Dan Hinkley found this variety in Japan with foliage that has chartreuse-gold centers with green and lime-green mottling across the leaves. The shrub is excellent as a solitary one in a container or as a foliage accent in a mixed container. And if you are into the camouflage look, this will make a great accent plant next to the driveway where you park your Hummer. Give this evergreen shrub some space in the shade. Another shrub that carries a tropical look is marginally hardy here. The shrub sizzles with dazzling flowers in summer. Two of the newest in the little angel series is Brugmansia 'Little Angel Yellow' and 'Little Angel Blush'. The shrub only grows five-feet high, yet there is nothing little about the flowers. The blossoms have the large trumpets of their taller sisters. 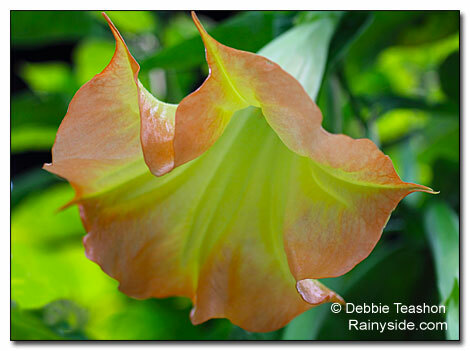 To have many trumpets on the plant, fertilize often, as it is a heavy feeder. Overwinter your brugmansias in an unheated garage and cut down on the water, keeping the soil just barely moist. Do not fertilize until spring. Slugs love the foliage so put a copper barrier strip around the pot to keep them from climbing up into the foliage. Originally written for the March/April 2016 issue of West Sound Home and Garden Magazine.